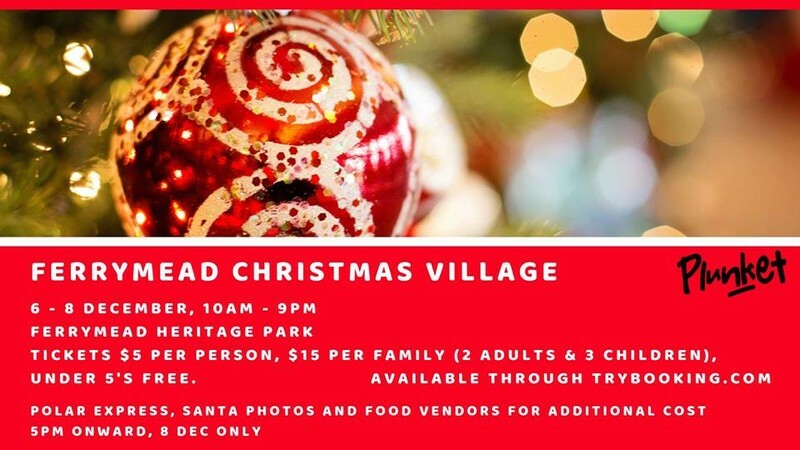 Ferrymead Heritage Park and Plunket are joining together to bring you our first ever Christmas Village. There will be 12 Christmas themed displays and craft stalls provided by community groups. You can vote for your favourite display and the winning community group display will receive $500. From 5pm to 9pm on each night you can get a photo taken with Santa. These are digital photos, which will be emailed to you and will cost $5 per photo. On the night of Saturday the 8th there will also be a Polar Express running. Polar Express ride tickets will only be available online. There will also be food trucks on Saturday night. We will keep you updated about other activities. Admission: Under 5's Free, Family (2 Adults & 3 Children) - $15 and Single entry over 5 - $5. Family package is $30, Single Entry is $12.50.